This page features a free printable Map Of South Dakota. 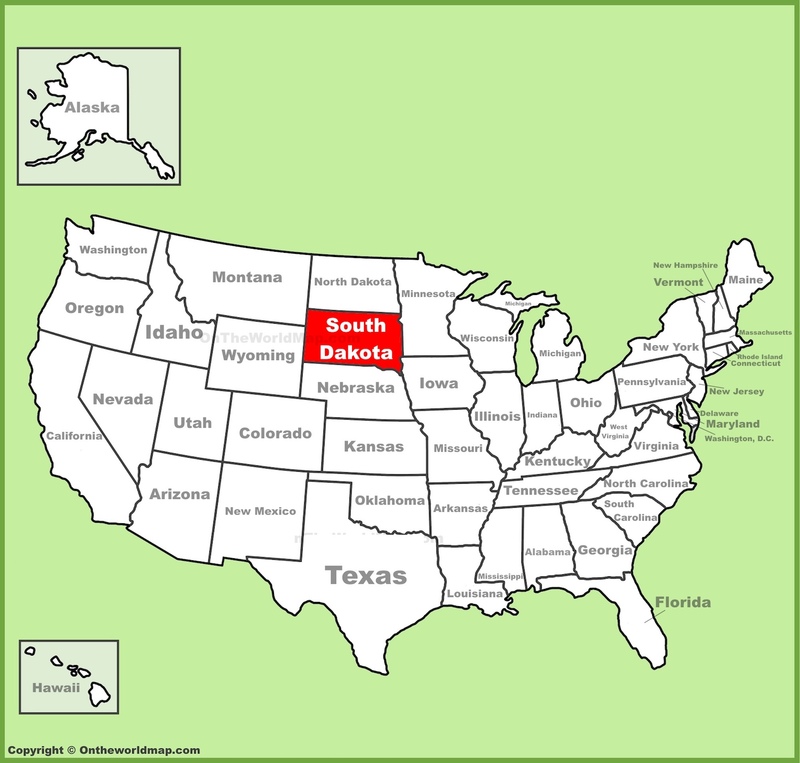 The above US map shows the location of the state of South Dakota in relation to other US states. On November 2nd of 1889, South Dakota became the 39th or 40th of 50 states admitted to the Union. North Dakota was admitted on the very same day. Scroll down to find a map of South Dakota, and more fascinating facts about the state. South Dakota is home to Mount Rushmore. This gigantic national monument is a mountain carved with the faces of four US Presidents - George Washington, Thomas Jefferson, Theodore Roosevelt, and Abraham Lincoln. The monument is about the size of a six-story building. 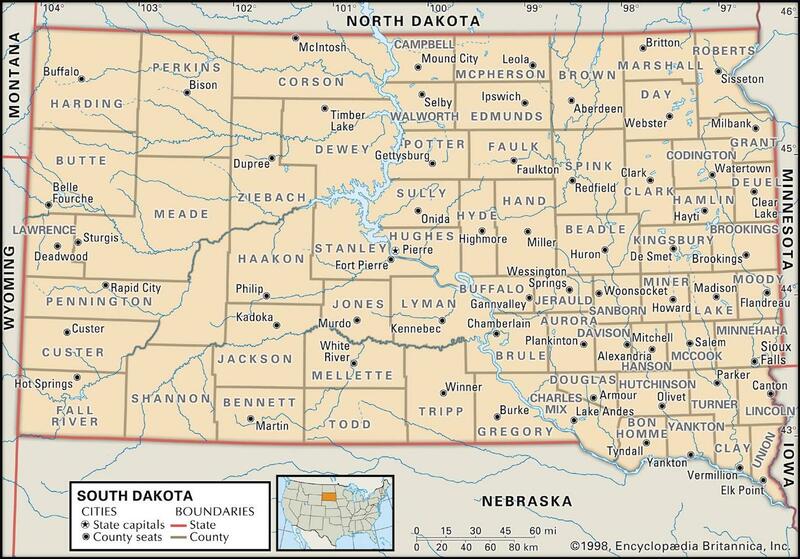 South Dakota has an average population density of 11 people per square mile. The most famous people to come from South Dakota are Sitting Bull and Crazy Horse. Click here to read Crazy Horse Appearing, an award winning contemporary novel about the great Lakota Chief. Jewel Cave National Monument is the 3rd longest cave in the world, spanning more than 150 miles. Laura Ingalls Wilder, the main character in Little House On The Prairie, grew up in South Dakota near De Smet. Lewis & Clark explored what is now the state of South Dakota back in 1804. Thanks to the Missouri River, South Dakota has more miles of shoreline than the state of Florida. Huron, South Dakota is home to the world's largest pheasant sculpture, measuring 40 feet from beak to tail. South Dakota is home to nine Indian Reservations, more than any other state. The Homestake Gold Mine in Lead, South Dakota was the largest and deepest gold mine in history until it closed in 2002. Above: This Map Of South Dakota depicts cities, counties, rivers, and surrounding states.